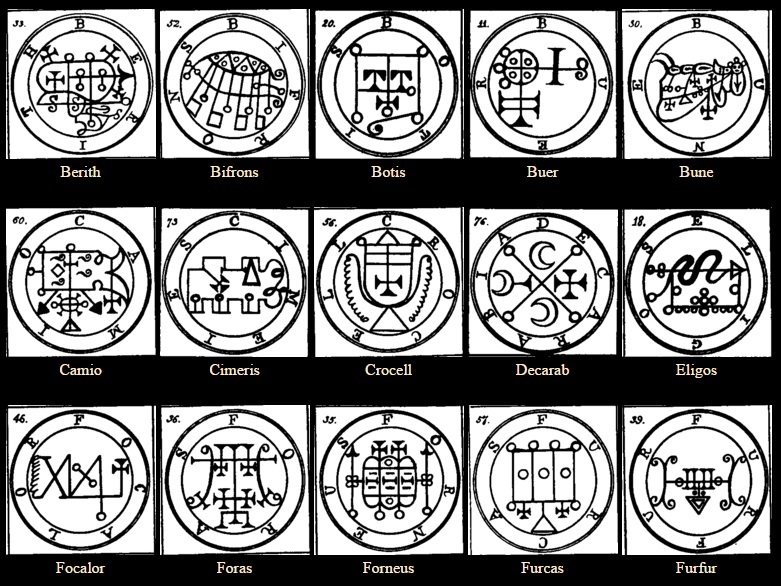 These are the Names of 72 demons from Joannes Wierus Pseudo-Monarchia Demonorum (1577) and from the Lemegeton (British Library, MS Sloane 3648, ed. by Kevin Wilby; published by Adam Mc Lean 1985). Voici les noms des 72 démons de Joannes Wierus dans son Pseudo-Monarchia Demonorum (1577) et selon le Lemegeton (British Library, MS Sloane 3648, édité par Kevin Wilby, publié par Adam Mc Lean 1985). 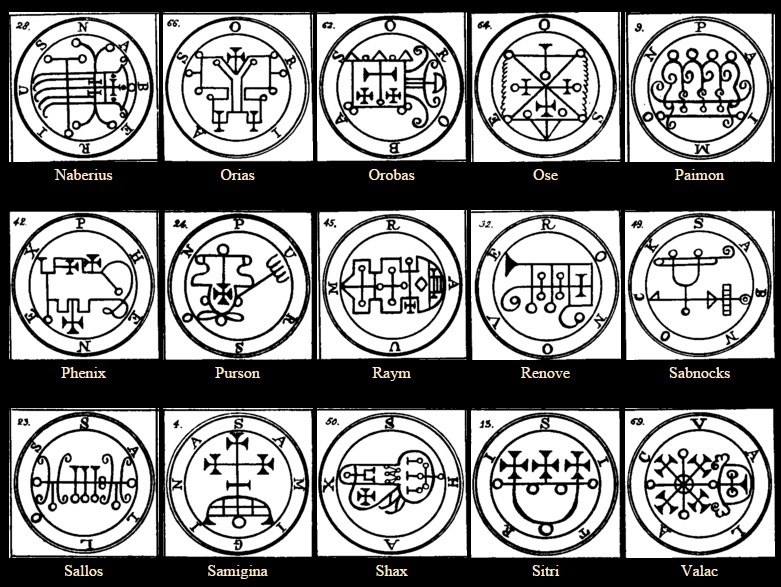 - Of the seventy-two infernal spirits evoked and constrained by King Salomon. The first principal spirit is a king ruling in ye East, called Bael. he maketh men goe Invisible, he ruleth over 66 Legions of Inferiour spirits, he appeareth in divers shapes, sometimes like a Catt, sometimes like a Toad, sometimes like a man, & sometimes in all these formes at once. he speaketh very horsly. The Third spirit is a mighty prince, being of ye same Nature as Agares, he is called Vassago, This spirit is of a good nature, & his office is to declare things past and to come; and to discover all things hidden or lost &c: he governeth 26 Legions of spirits. This is his seal. The 4th spirit is called Gamigin, a great Marquise, he appereth in ye forme of a litle horse or asse and then into humane shape he putteth himself at ye request of ye Master and speaketh wth a horse voice; he teaches all Liberall siences, and giveth and account of ye dead soules of them that dye in sin. & he ruleth over 30 Legions of Inferiors &c. This is his seal, wch is to be worne by the Magician when he Invocateth. The 5th spirit is called Marbas -- he is a great presedent, and appeareth at first in ye forme of a great Lyon: but afterwards putteth on humane shape at ye Request of ye Master he Answareth truly of Things hidden or secreet, he causeth deseases and cureth them againe & giveth great wisdome & knowledge in mechanicall arts, & changeth men into other shapes he governeth 36 Legions of spirits. his seal is this. 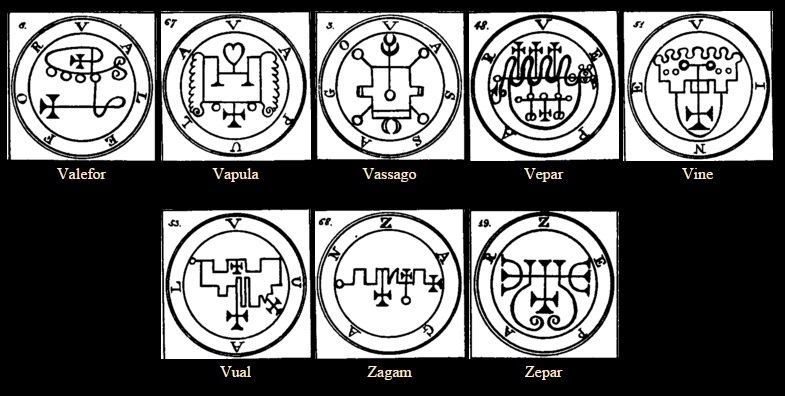 The 6th spirit is Valefar -- he is a Mighty Duke, & appeareth in ye form of a Lion wh a mans head Lowring, he is a good femiliar, but tempteth those he is femiliar with to steale, he governeth 10 Legions of spirets, this is his seal to wearne constantly if you haue his familiarity. Else not. The 7th spirit is Amon. he is a Marquis great in power & most strong, he at first appereth like a wolf with a serpents taile, vomiting out of his Mouth fleames of fire, but at ye command of ye Magician he putteth on ye shape of a man, with dogs Teeth beset in a head like a Raven, or in a Ravens Head, hee telleth [of] all things past & to come, and procureth love, and reconcileth controversies between freinds & foes,1 & governeth 40 Legions of spirits, his seal is thus, wch is to be worne as afforesaid. The 8th spirit is called Barbatos he is a great duke & appeareth when ye sun is in Sagittarius,2 with four Noble kings and their companions in great troops, he giveth ye understanding of ye singing of Birds, and ye voice of other Creatures and ye [such as] barking of dogs &c, he breaketh hidden treasures open, that have been Laid by ye Enchantment of Magicians, & [he was] of ye order of vertues, [of] which some part beareth rule still &c he knoweth all things past and to come: and reconsileth friends & those that are in power, he ruleth over 30 Legions of spirits, his seal of obedience is this. wch were before you &c.
The 9th spirit in order is Paimon; a great king, & very Obedient to Lucifer, he appeareth in ye forme of a man, sitting one a dromedary, wh a Crowne most glorious on his head. Three [There] goeth before him a host of spirits like men with Trumpets and well sounding Cymballs, and all other sorts of musicall Instruments &c. he hath a great voice, and roareth at his first comming, and his speech [voice] is such as ye Magician cannot well understand, unless he compelleth him. This spirit can teach all arts and siences, and other secret Things; he can discover wt ye Earth is, and wt holdeth it up in ye waters, & wt ye wind is or where it is, or any other Thing yu desire to know, he giveth dignity and confirmeth ye same, he bindeth or maketh a man subject to ye Magician if he desireth it he giveth good familiars, and such as can teach all arts, he is to be observed towards ye North west, he is of ye order of dominions and hath 200 Legions of spirits under him, one part of them is of ye order of Angells & ye other of Potestates [Potentates], If yu call this spirit Paimon alone yu must make him some offering to him & there will attend him 2 kings called Bebal & Abalam, & other spirits of ye order of Potestates [Potentates] in his host are 25 Legions because all those spirits wch are subject to him, are not allwayes wth him unlesse ye Magician compelleth them, This is his Character. The 10th spirit is Buer, a great president and appereth in Sagittarius that is his shape when ye Sun is there, he teacheth Phylosophy [both] Morall & Naturall, & ye Logicall arts, & ye vertues of all hearbes & plants, & healeth all distempers in Man, & giveth (familiars) good familiars, he governeth over 50 Legions of spirits and this is his seale of obediance wch you must weare when you call him to apperance. The 11th spirit is a great & strong duke called Gusoin [Gusion], he appeareth like a Xenophilus he telleth of all things past, present & to come: he sheweth ye meaning of all questions you can ask, he reconcileth friends and giveth honour and dignity to any, and ruleth over 40 Legions of Spirits. his seal is this, wch weare as aforesaid &c.
The 12th spirit is Sitri, he is a great prince & appeareth at first with a Leopards face, and wings as a griffin. 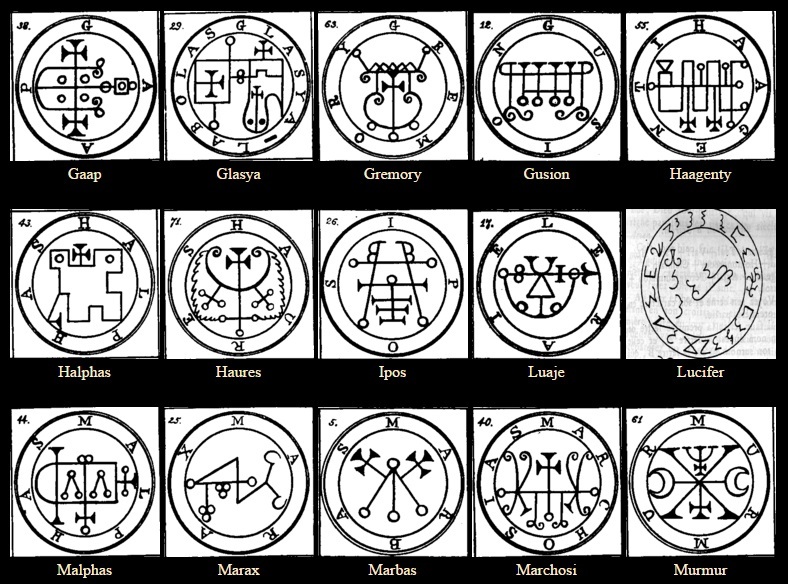 But afterwards at ye command of ye exorcist, he putteth on a humane shape very Beautifull, Inflaming Men with womens Love, and women with mens love, and causeth them to shew themselves Naked, if he [it] be desired, &c. he governeth 60 Legions of spirits, and his seal to be worne is this. The 13 spirit is called Beleth, he is a mighty king and terrable, ridding on a pale horse wth Trumpets and all other kinds of Musicall Instruments playing before him, he is very furious at his first apperance That is whilest ye Exorcist allay his Courage, for to doe that, he must hold a hazel stick in his hand, streched forth towards ye South & East quarters making a Triangle without ye Circle, commanding him into it by ye vertue of ye Bonds & chaines of spirits hereafter following, & if he doe not come into ye triangle by your Threats, rehearse ye Bounds & chaines before him, and then he will yeild obediance and come into it and do what he is commanded by ye Eorcist [Exorcist], yet he must receive him courteously, because he is a great king & doe homage to him, as the kings and princes doe that attend him, and you must [also] have allwayes a silver Ring on the middle finger of the left hand, held against your face as they do for Amaimon, This king Beleth causeth all ye love that possible may be, both of Men and women till ye Master Eorcist [Exorcist] hath had his mind fullfilled &c. he is of the order of Powers and governeth 85 Legions of [102v] spirits, his Noble seal is this wch is to be worne before you in the Time of working. The 14th spirit is called Leraye (or Leraje) [written intra linea]. he is a Marquize great in power shewing him selfe in ye likeness of an archer, cladd in green carring [carrying] a Bow and quiver, he causeth all great Battles & contests, & causeth ye wounds to putrifie that are [made] wth arrows by archers this belongeth to Sagittarius he governeth 30 Legions of spirits, & his seale of obediance is this. The 15th spirit is called Eligor [Eligos], a great duke, he appeareth in [the] form of a goodly knight carring a lance an Ensigne & a serpent, he discovereth hidden Things & knoweth things to come, & of warres and how the soulders will & shall meet, he causeth the love of Lords and great persons, and governeth 60 Legions of spirits, his seal is this, wch wear or else he will not appear nor obey you &c.
The 16th spirit is called Zepar, he is a great duke & appeareth in red apparell & armed like a souldier, his office is to cause women to love Men and to bring them togather in love he also maketh them barren, and governeth [over] 26 Legions of Inferiour spirits, his seal is this, wch he obeyeth when he seeth it. The 17th spirit is called Botis a great president and an Earle; he appeareth at ye [first] shew in ye form of an ugly viper Then at ye command of ye Magician he putteth on humane shape, with great teeth, Two horns, carring a sharp bright sword in his hand, he telleth of all Things past and to come and reconcileth friends and foes, he governeth 60 Legions of spirits his seal is this, that he obeyeth when he seeth it. The 18th spirit is called Bathin, he is a mighty [and] strong duke & appeareth like a strong man wth ye Taile of a serpent, sitting on a paile couloured horse he knoweth the vertue of hearbes & precious stones, & can transport men suddenly from one Country into an other, he ruleth over 30 Legions of spirits his seal is thus to be made and to be worne before you. The 19th spirit is called Saleos, he is a great and mighty duke, & appeareth in [the] form of a gallant souldier, ridding on a Crocodile, wth a dukes crowne on his head peaceably he causeth ye love of women to men & men to women, he governeth 30 Legions of spirits his seal is this, wch must be worne before you. The 20th spirit is called Purson a great king; he appeareth commonly like a man wth a Lyons face, carring a cruel viper in his hand, and ridding on a Bear goeing before him [are] many Trumpets sounding; he knoweth hidden things and can discover Treasures & tell all Things present past and to come; he can take a Body either humane or aiery, and answareth Truly of all Earthly Things, both secreet & devine, & of ye Creation of ye world, he bringeth forth good familiars, & under his government [power] are 22 Legions of spirits, partly of ye order of vertues & partly of ye order of Thrones, & his mark or seal is this, wch he oweth obediance to & [which] must be worne by ye Exorcist in [the] Time of acction. The 21 spirit is called Morax he is a great Earle and a president, he appeareth like a great Bull wth a mans face; his office is: to make men very knowling [sic] in Astronomy, and all ye other Liberall siences; he can give good familiars and [very] wise, wch know ye vertues of hearbes & precious stones he governeth 36  Legions of spirits, & his seal is to be made Thus and worne [as aforesaid]. The 22d spirit is called Ipos --, he is an Earlr and a mighty prince, and appeareth in ye forme of an angel, wth a Lions head gooses feet & a haires Taile, he knoweth Things past and to come; he maketh Men witty and bold, and governeth 36 Legions of spirits, his seal or Charecter is This, wch must be worne as a Lamen before you. The 23d spirit is called Aim, a greatt duke and strong, he appeareth in ye forme of a very handsome man in Body, [but] wth 3 heads, The first like a serpent ye second like a man wth 2 starrs in his forehead, The Third [head] is lik [sic] a Catt; he rideeth on a viper, carring a fire brand in his hand burning, whereth [wherewith] he sets Citties Castles & great places on fire he maketh one witty [in] all manner of wayes, and giveth true answares to privy matters, he governeth 26 Legions of Infernall spirits; his seal is thus to be made, and worne as a Lamen before you. The 24th spirit is called Naberius, he is a most valliant Marquiz, & appeareth in ye forme of a Black Crow, fluttering about the Circle, & when he speaketh it is with a hoarse voice; he maketh men cunning in all arts & siences, but especially in ye art [of] Rhetoric; he restoreth lost dignity and honours, & governeth 19 Legions of spirits his seal is this, wch must be worne. The 25th spirit is called Glasya Labolas, he is a Mighty president & sheweth him selfe in ye forme of a dog wth wings like a griffin; he teacheth all arts in an Instant, and is an author of Blood shed & Manslaughter, he telleth all Things past & to come, if desired, & causeth love of friends and foes; he can make a Man goe Invisible, & he hath under his rule 36 Legions of spirits, his seal is this, ye wch weare [must be worn] as a Lamin. & Nota he hath another seal or Character wch is made Thus. yu may use wch yu will, but ye first is best as Salomon saith. The 27th spirit is called Ronove, he appeareth in ye forme of a Monster, he teacheth ye art of Rhetorick very well, and giveth good servants knowledge of Tongues, favouer of friends & foes; he is a Marquiz & a great Earle, and there obeieth him [he commandeth] 19 Legions of spirits his seal is this. The 28th spirit in order as salomon bound them, is named Berith. he is a Mighty great and terrable duke, he hath two other Names given to him by men of latter Times, viz: Beal & Bolfry, he appeareth like a souldier wth red clothing, ridding on a red horse & [having] a Crown of Gold upon his head he giveth True answards of things [concerning the] past present & to come; you [must] use a Ring as is before spoken of [with] Beleth in calling him forth; he can turne all mettals into Gold, he can give dignity & [can] confirm them to Men, he speaketh wth a very clear & subtill voice, he is a great Lyer and not to be Trusted much he governeth over 26 Legions of spirits his seal is this which must be worne as [a] lamin. The 29th spirit in order is Named Astaroth, he is a Mighty & strong duke, & appeareth in [the] forme of an unbeautifull angel, ridding on an Infernall like dragon, and carring in his right hand a viper (you must not lett him come to neare yu least he doe yu damage by his stinking Breath. Therefore ye Exorcist must hold ye Magicall Ring nere to his face and yt will defend him he giveth true answares of things present past & to come & can discover all secreets; he will declare willingly how ye spirits fell, if desired, & ye reason of his own fall. 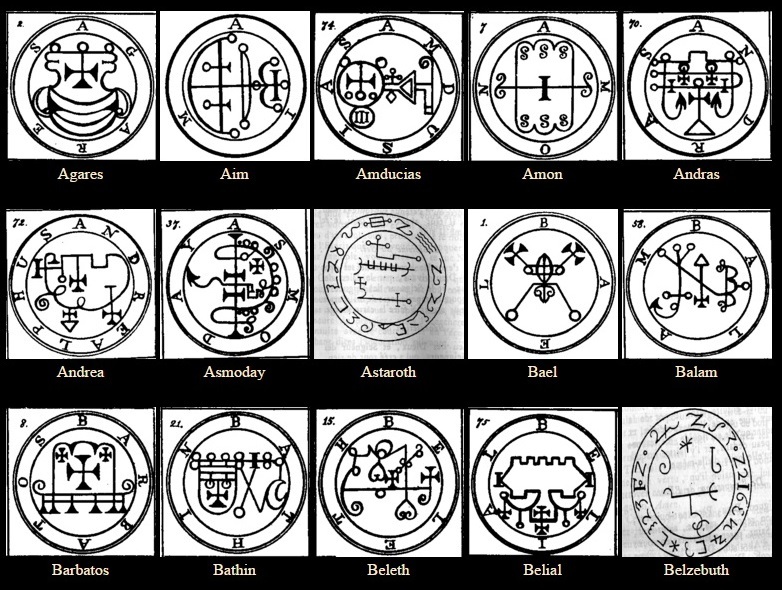 He can make men wounderfull knowing in all Liberall siences; he ruleth 40 Legions of spirits, his seal is as this [shown], wch weare as a Lamen before yu, or else he will not obey you. The 30th spirit is called Forneus, he is a mighty great Marquiz, & appeareth in ye forme of a great sea Monster, he Teacheth & maketh men wounderfull knowing in ye art of Rhetoric he causeth men to have a good Name, and to have ye understanding of Tongues; he maketh men to be beloved of their foes as well as they be by their Friends; & he governeth 29 Legions of spirits, partly of ye order of Thrones and partly of angels, his seal is this to be made and worne as aforesaid &. The 31 spirit in order, [as Salomon saith,] is named Foras, he is a mighty great president & appeareth in ye form of a strong man, in humane shape he can give ye understanding to men how they may know ye vertues of all hearbs & precious stones, & [he] teacheth them ye art [of] Logick & Ethicks in All their partes if desired, he maketh men Invisible, witty, Eloquent & to live Long; he [can] discover Treasures and recover Things lost, & he ruleth over 29 Legions of spirits, his seale or Character is thus to be made & worne as a Lamen. The 32d spirit in order is called Asmoday. he is a great king, strong & powerfull, he appeareth wth 3 heads, whereof ye first is like a Bull The second like a Man, The third like a Ram, [he appeareth also] wth a serpents Taile, Belching or vomitting up flames of fire out of his mouth his feet are webed like a Goose, he sitteth on an Infernall dragon carring a Launce and a flagg in his hands, he is ye first & chifiest under ye power of Amaymon, & goeth before all others: when the [105r] Exorcist hath a mind to call him, lett it be abroad, and lett him stand on his feet all ye Time of action, wth his cap of [off], for if it be on, Amaymon will deceive him and cause all his doeing to be bewrayed, But as soone as ye Exorist [Exorcist] seeth Asmoday in ye shape aforesaid, he shall call him by his Name, saying, thou art Asmoday, & he will not deny it; & by & by he will bow down to ye ground &c he giveth ye Ring of vertues he teacheth ye art of Arithmitic, geomitry, Astronomy and all [other] handicrafts absolutely; he giveth full & True answares to yr demands, he maketh a man Invisible, he showeth ye place where Treasures layeth, and guardeth it if it be among ye Legion of Amaymon, he governeth 72 Legions of Inferiour spirits, his seal is thus to be made and worne as a Lamen before [thee] on your Breast. The 33d spirit is Gaap. he is a great president & a mighty Prince, he appeareth when ye Sun is in some of ye Southern Signes, in a humane shape, [Clm 849 reads: "He appears in the form of a doctor (medici, not meridii=southern as in Weyer) when he takes on a human form"] goeing before 4 great & mighty kings, as if he was a guide to conduct them along in their way. his office is to make men knowing in Phylosophy and all ye Liberall siences; he can cause love or hatred, and make men Insensible he can Teach yu how to consecrate those Things that belong to ye dominion of Amaymon his king & can dilever [deliver] familiers out of the custody of other Magicians; and [he also] answareth Truly and perfectly of Things past present and to come, & can carry and recarry [things] most speedily from one kingdome to another, at ye will and pleasure of [the] Exorcist, he ruleth over 66 \ Legions of spirits he was of ye order of potestates [potentates]; his seal is thus to be made & worne as a Lamen &c.
The 34th spirit is called Furtur [Furfur], he is a great & mighty Earle, appearing in ye forme of an hart wth a firey [fiery] Taile; he never speaket [speaketh] Truth, except he be compelled or brought up wthin a Triangle, being compelled therein, he will take upon himselfe ye forme of an angel being bidden; he speaketh with a hoarse voice, & will [can] willingly make love between man & wife he can raise Thunder, Lightnings, Blasts and great Tempestuous stormes &c he giveth true answares both of secreet and devine Things if commanded, and ruleth over 26 Legions of spirits, his seal is this which is to be [made &] worne as a Lamin &c.
The 35 spirit is called Marchosias, he is a great and mighty Marquiz appering at first in [the] forme of a wolfe; having griffins wings, and a serpents Taile, vomiting up fire out of his mouth But afterwards at ye command of ye Exorcist, he putteth on ye shape of a man, and is a strong fighter he giveth true answares to all questions, & is very faithfull to ye Exorcist in doeing his Buisness [sic], he was of ye order of dominations he governeth 30 Legions of spirits, he Told his chiefe Master wch was Salomon, that after 1200 yeares he hadd hopes to returne to ye 7th Throne &: his seal is thus, to be made, & worne as a Lamin &c.
The 36th spirit is called Stolas, he is a great and powerfull Prince, appearing in ye shape of a Night Raven at first before ye Exorcist, but afterwards he taketh the image of a man &c; he teacheth the Art of Astronomy, & the vertuses [sic] of hearbs & precious stones, he governeth 26 legions of spirits his seal is thus to be made & worne as a Lamin. The 37th spirit is called Phoenix he his [is] a great Marquiz & appeareth like ye [form of the] Bird Phoenix having a Childs voice, he singeth many sweet notes before ye Exorcist, wch he must not regard, but by & by he must bidd him [to] put on a humane shape, Then he will speak Mervellously of all wounderfull siences; he his a good & excellent Poet, & will be willing to doe yr Request he hath hopes to returne to ye 7th Throne affter 1200 yeares more, as he said to Salomon, he governeth 20 Legions of spirits, his seal is Thus to be made, & worne &c.
The 38th spirit is called Halphas he is a great Earle and appeareth in ye forme of a stock dove, and speaketh wth a hoarse voyce; his office is to build up Towers & to furnish them wth ammunition and weapons, and to send men of warre to places appointed; he ruleth 26 Legions of spirits; his seal is Thus to be made, & worne as a Lamen &. The 39th spirit in order is called Malphas, he appeareth at first in ye forme like a Crow, But affterwardes will put on a humane shape at ye request of ye Exorcist & speake wth a hoarse voyce; he is a mighty president and powerfull he can Build houses & high Towers & he can bring quickly artificers togather from all places of ye world; he can destroy ye [thy] Enemies desires or thoughts, and wt [all that] they have done; he giveth good familiars, & if yu make any sacrifices to him, he will receive it kindly and willingly, But he will deceive him yt doth it; he governeth 40 Legions of spirits; his seal is Thus to be made and worne as a Lamen &. 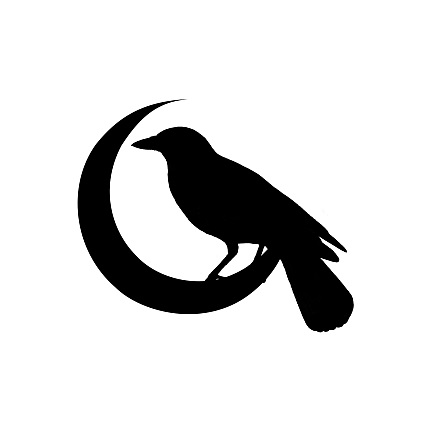 The 40th spirit is called Raum, he is an Earle, & appeareth at first in ye forme of a Crow but affterwards, at ye command of ye Exorcist he putteth on humane shape his office is to steale Treasures out of kings houses, and to carry it where he is commanded, & to destroy Citties, and ye dignities of men; & to tell all Things past, & wt is, & wt will be; & to cause Love between friends & foes; he was of ye order of Thrones, and governeth over 30 Legions of spirits his seal is Thus, which make and weare as a Lamin before you. The 41 spirit in order is called Focalor he is a great duke & strong, & appeareth in ye forme of a Man with griffins wings; his office is, to kill men, and to drown them in ye waters, and to over throw ships of warre, for he hath power over both winds and seas, but he will not hurt any man or Thing, if he be commanded to ye contrary by ye Exorcist; he hath hopes to returne to ye 7th Throne after 1000 yeares; he governeth 3 Legions of spirits, his seal is this wch must be worne as a Lamin. The 42d spirit is Named Vepar he is a great & strong duke, & appeareth like a Mairmaid, his office is to guide ye waters, & ships Ladden wth armour thereon he will at ye [will of the] Exorcist cause ye seas to be rough and stormy, and to appeare full of ships he causeth men to dye in 3 dayes wth putrifying their sores and wounds, & causing wormes in them to bred &c he governeth 29 Legions of spirits, his seal is Thus to be made and worne as a Lamin &c.
The 43d spirit in order as Salomon commanded them into ye Brazen vesel is called Sabnach he is a Mighty great Marquiz, & strong appearing in ye forme of an armed souldier wth a Lyons head, ridding on a pale couloured horse, his office is to build high Towers, Casteles and Citties, and to furnish them wth armour, & to afflict men severall dayes wth wounds & rotten sores full of wormes; he giveth good familiars at ye command of ye Exorcist he commandeth 50 Legions of spirits, his seal is Thus to be made, and worne as a Lamin &c.
The 44th spirit in order is named Shax, he is a great Marquize & appeareth in ye forme of a stock dove, speaking wth a hoarse & subtill voyce. his office is to take away ye sight, hearing & understanding of any man or woman at ye command of ye Exorcist, & to steal money out of kings houses & carry it againe in 1200 yeares, if commanded, he will fetch horses or any Thing at ye Request of ye Exorcist, but he must be commanded into a Triangle first or else he will deceive him, & tell you many lyes, he can discover all Things that are hidden & not kept by wicked spirits, he giveth good familiars sometimes, he governeth 30 Legions of spirits his seal is thus to be made, and worne as a Lamin &c.
The 45 spirit is called Vine, he is a great king & an Earle, & appeareth in ye forme of a Lyon ridding on a Black horse wth a viper in his hand his office is to discover Things hidden, witches, and Things present past & to come. he, at ye command of ye Exorcist, will build Towers, Throw down great stone walls, make waters rough wth stormes &c, he governeth 35 Legions of spirits, his seal is this, wch make and wear as a Lamin &c.. The 46th spirit is called Bifrons, he is an Earle and appeareth in ye forme of a Monster at first but after a while at ye command of ye Exorcist he putteth on ye shape of a man, his office is to make one knowing in Astrology & geomitry & other arts & siences, & Teacheth ye vertues of all hearbs, precious stones & woodes, he changeth ye dead Bodyes & putteth Them into one another [anothers'] places, & lighteth candeles seemingly upon ye graves of ye dead he hath under his command 6 Legions of spirits, his seal is this, wch he will owne and submit unto &c.
The 47th spirit is called Vual. he is a great & mighty strong duke, he appeareth in ye forme of a mighty dromedary at first, but after a while he putteth on humane shape, and speaketh in ye Egyptian Tongue, but not perfectly; his office is to procure ye love of women, and to tell Things past, present and to come, and also to procure friendship betweene friends & foes, he was of the order of Potentates; he governeth 37 Legions of spirits; his seal is Thus to be made and worne as a Lamin before you &c.
The 48th spirit is called Haagenti, he is a great president appearing in the forme of a mighty Bull wth griffins wings at first, But afterwardes at ye command of the Exorcist, he putteth on humane shape &c his office is to make men wise and to Instruct them in divers Things & to Transmute all mettales into gold, & change wine into water, & water into wine; he commandeth 33 Legions of spirits; his seal is Thus made, & to be worne as a Lamin &c.
The 49th spirit is named Procel, he appeareth in ye forme of an angel, he is a great & strong duke, speaking somthing mystically of hidden Things; he Teacheth ye art of geometry & ye Liberall siences, he at ye command of ye Exorcist, will make great Noises, like ye running of great waters, allthough there be none he warmeth waters and distempereth [discovereth] Bathes &c he was of ye order of potestates [potentates] (as he declared to Salomon) before his fall, he governeth 48 Legions of spirits, his Character or Marke is Thus to be made, & worne as a Lamin before you. The 50th spirit in order is called Furcas, he is a knight & appeareth in ye forme and similitude of a cruel old man wth a long Beard and a hairy head, sitting on a pale colloured horse, wth a sharpe weapon in his hand; his office is to teach ye art of Phylosophy, astronomy, Rhetoricl, logick, Chyromancy & Pyromancy in all their partes perfectly, he hath under his power 20 Legions of spirits, his seal or Mark is this wch make & weare as a Lamin. The 51 spirit in order is Balam, he is a Terrable, great & powerfull king, appearing wth 3 heads, The first is like a Bulls, The second like a Mans, & ye Third like a Rams head he hath a serpents Taile, & Eyes flaming; riding upon a furious Beare, carrying a goshawke on his fist, he speaketh wth a hoarse voyce, giving True answares of Things past present & to come, he maketh men to goe invisible & witty he governeth 40 Legions of spirits his seal is Thus [to be] Made, & to be worne as a Lamin &c.
The 52d spirit [in order] is called Alloces -- he is a great & mighty strong duke, appearing in ye forme of a souldier ridding on a great horse; his face is like a Lyons, very redd, having Eyes flaming, his speech is hoarse & verry Bigg; his office is to teach ye art of Astronomy, & all ye Liberall siences, he Bringeth good familiars & ruleth 36 Legions of spirits, his seal is Thus made, & [is] to be worne, &c.
The 53d spirit is called Caim, he is a great president & appeareth in ye forme of a Bird called a Thrush at first, but after a while he putteth on ye shape of a man carring in his hand a sharp sword; he seemeth to answare in Burning ashes, he is a good disputer, his office is to give men ye understanding of all Birds, loweing of Bullocks, Barking of doggs & other Creatures, and also ye Noise of waters, and [he] giveth very true answares of Things to come; he was of ye order of angels, & now Ruleth 30 Legions of Infernall spirits; his seal is This, wch wear as a Lamin. The 54th spirit in order is called Murmur, he is a great duke & an Earle, & appeareth In ye forme of a souldier ridding on a griffin with a dukes Crown on his head, there goeth before him two of his Ministers, wth great Trumpets sounding, his office is to teach Phylosophy perfectly, & to constraine soules discesed [deceased] to come before ye Exorcist to answare those things yt he shall aske them, if he desireth, he was partly of ye order of Thrones & partly [of the order] of angels, & [he] Ruleth now 30 Legions of spirits, his seal is this, wch is to be worne as a Lamin &c.
The 55th spirit is called Orobas, he is a mighty great prince, appearing at first like a horse, But afterwards at ye command of ye Exorcist he putteth on ye Image of a man, his office is to discover, all Things past, present & to come and to give dignities & places & ye favour of friends & foes, he giveth true answares of divinity & of ye Creation of ye world, he is faithfull to ye Exorcist & will not suffer him to be Tempted by any spirit he governeth 20 Legions of spirits, his seal is this, wch must be made & worne as a Lamin &c.
The 56 spirit is called Gemory, he is a strong and powerfull duke appearing in The forme of a Beautifull woman, wth a Dutches [Duchess] Crownett Tyed about her middle, ridding on a great Camell, his office is to tell of all Things past present & to come, and of Treasure hidden and wt it layeth in, & procureth ye love of women, both young & old, he governeth 26 Legions of spirits, his seal is Thus made, & worne as a Lamin before ye Exorcist in [the] Time of working. The 57 spirit is called Ose, he is a great president & appeareth like a Leopard at first, But after a little Time he putteth on ye shape of a man, his office is to make one cunning in ye Leberall [liberal] siences & to give True answares of devine & secreet Things, and to change a man in [to] any shape that ye Exorcist desireth so that he that is so changed will not thinck any other Thing but that he is that Creature or Thing, he is Changed into, he governeth 3 Legions of spirits, his seal is This, wch wear as a Lamin. The 58th spirit is called [named] Amy, he is a great president, & appeareth at first in ye forme of a flaming fire, But after a while he putteth on ye shape of a man, &c: his office is to make one wounderous [wonderfully] knowing in Astrology & all ye Leberall [liberal] siences; he giveth good familiars & can bewray Treasures, wch are kept by spirits; he governeth 36 Legions of spirits, [&] his seal is This, wch wear as a Lamin &c.
The 59 spirit is named Orias, he is a great Marquiz and appeareth in ye forme of a Lyon, riding on a mighty horse, wth a serpents Taile, holding in his right hand 2 great serpents hissing, his office is to Teach ye vertues of ye starres and to know ye Mansions of ye planets, and how to understand their vertues, also he Transformeth men & giveth dignities and places [prelacies], and confirmations, & ye favour of friends & foes, he governeth 30 Legions of spirits, his seal is This, to be made & worne &c.
The 60th spirit is called Vapula, he is a great mighty & strong duke, appearing in ye forme of a Lyon, wth griffins wings; his office is to make men knowing in all handicraft proffecsions also in Phylosophy & other siences &c he governeth 36 Legions of spirits, his seal or Character is Thus made, and is to be worneas a Lamin &c.
The 61 spirit is called Zagan, he is a great king & president, and appeareth at first in ye forme of a Bull wth griffins wings, But afterwardss he putteth on humane shape, he maketh men witty, and can turne wine into water & Blood into wine, and also water into wine he can turne all mettals into Corne [coin] of that dominion ye mettles are of & can make foolls wise he governeth 33 Legions of spirits; his seal is Thus made & worne as a Lamin. The 62d spirit is called Valac, he is a mighty great president & appeareth like a Boy wth angels wings, ridding on a 2 headed Dragon; his office is to give True answares of hidden Treasures, and to tell where serpents may be seene, wch he will bring & dilever [deliver, discover] to ye Exorcist without any force or strengeth, he governeth 30 Legions of spirits, his seal is This wch must be made & worne as a Lamin &c.
The 63 spirit is called Andras, he is a great Marquiz appearing in ye forme of an angell wth a head like a Black night Raven, ridding upon a strong black woolf, wth a sharpe bright sword flourishing in his hand, his office is to sow discords, if ye Exorcist hath not care he will kill him and his fellows, he governeth 30 Legions of spirits his seal is Thus to be [made, and] worne as a Lamin before [thee] on your Breast. The 64th spirit is named Flauros, he is a great duke, and appeareth at first like a mighty Terrable and strong Leopard but afterwards at ye command of ye Exorcist he putteth on ye shape of a man wth fiery Eyes and a Terrable Countenance; he giveth True answares of all Things past present & to come, but unless he be commanded into a [the] Triangle, he will Lye in all those things and deceive or beguile ye Exorcist in other Things or Buisness [sic], he will gladly talke of divinity, and of ye Creation of ye world, and of his and all other spirits fall [falls], he destroyeth and burneth those That are ye Exorcist [Exorcist's] enimies if he Requesteth it, and will not suffer him to be Tempted by any spirit or otherwise; he governeth 36 Legions of spirits, his seal is Thus to be made, & worne as a Lamine &c.
The 65 spirit is called Andrealphus, he is a Mighty great Marquiz appearing at first in ye forme of [a] Peacock, with great Noises but afterwards he putteth on humane shape, he can teach perfectly geomitry, & all Things belonging to measuring, [&] also Astronomy, he maketh men very subtile and cunning therin, he can Transforme a Man into ye likness of a Bird & he governeth 30 Legions of spirits his seal is This, wch is to be worne as a Lamin &c.
The 66th spirit is called Cimeies he is a mighty great Marquiz strong & powerfull appearing like a valiant souldier, riding on a goodly Black horse; he ruleth over all spirits in ye part of Africa, his office is to Teach perfectly grammar Rhetoric [&] logick and to discover Treasures & Things lost or hidden, he can make a man seeme like a souldier of his own likeness, he governeth 20 Legions of cheefe [chief] spirits, but more Inferior [than] himself his seal is Thus made, & worne as a Lamin &c.
The 67th spirit in order is called Amduscias, he is a strong & great duke appearing at first like an Unicorne, But afterwards at ye Request of ye Exorcist he standeth [110r] before him in humane shape causing Trumpets and all manner of Musicall Instrument to be heard But not seene also [causing] Trees to bend and Incline according to ye Exorcist [Exorcist's] will; he giveth Excellent familiars & ruleth 29 Legions of spirits his seal is Thus formed and is to be worne as a Lamin &c.
The 68th spirit is called Belial, he is a mighty king and powerfull; he was Created next after Lucifer, & is of his order; he appeareth in ye forme of a Beautiful angel sitting in a Charriot of fire, speaking wth a comly voice, declaring that he fell first & amongst ye worthier & wiser sort wch went before Michael & other heavenly angels; his office is to distribute preferments of senatorships, and to cause favour of friends & foes, he giveth Excellent familiars & governeth 80 Legions of spirits. Note this kink [! king] Belial must have offerings sacrafices & gifts presented to him, by ye Exorcist or else he will not give True answares to his demands; But then he Tarryeth [will tarry] not one hour in ye truth except [unless] he be constrained by devine power & his seal is Thus wch is to be worne as a Lamin, before ye Exorcist &c.
The 69 spirit is called Decarabia, he appeareth in ye forme of a starre in ye Pentacle at first, but afterwards at ye command of ye Exorcist, he putteth on ye Image of a man, his office is to discover ye vertues of hearbs and precious stones; and to make ye similitude of all Birds to fly before ye Exorcist, & to Tarry wth him, singing and Drinking as Naturall Birds doe, he governeth 30 Legions of spirits, being himselfe a great Marquiz, his seal is Thus to be made, and worne as a Lamin before ye Exorcist &. The 70th spirit in order is called Seere, he is a Mighty Prince and powerfull under Amaymon, king of ye East he appeareth in ye forme of a Beautifull Man, riding on a strong horse wth wings: his office is to goe & come, and to bring all Things to pass on a sudden & to carry & recarry any Thing where Thou wilt have it, or have it from for he can pass over ye whole world in ye Twinckling of an Eye, he maketh a True relation of all sorts of Theft and of Treasures hidd, and of all other things, he is Indifferent good Natured, willing to do any thing ye Exorcist desireth; he governeth 26 Legions of spirits, his Mark or seal is Thus made, and is to be worne as a Lamin &c.
The 71 spirit is called Dantalion, he is a great & Mighty duke appearing in ye forme of a Man wth many faces, all like men & women, & a Booke in his right hand; his office is to Teach all arts and siences to anyone, and to declare ye secreet Councelles of anyone, for he knoweth ye Thoughts of all men and women, and can change them at his will, he can cause love and shew (by vision) ye true similitude of anyone lett them be in wt place or part of ye world they will, he governeth 36 Legions of spirits his seal is This, wch is to be worne as a Lamin. The 72d spirit in order is called Andromalius he is a great and Mighty Earle appearing in ye form of a Man, holding a serpent in his hand, his office is to bring a theefe & goods yt are stolen, Back; and to discover all wickedness, and understand dealings, & to punish Theives [thieves] & other wicked people, & to discover Treasure that is hidd, &c, he ruleth 36 Legions of spirits his seal is This, wch make & wear as a Lamin in time of acction &c.
The Seals of the 72 Spirits of The Ars Goetia + Astaroth / Belzebuth / Lucifer.